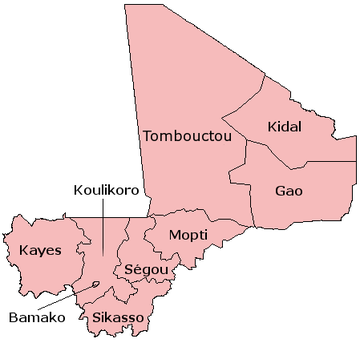 Since 2016, Mali has been divided into ten regions and one capital district. A reorganization of the country from eight to nineteen regions was passed into law in 2012, but of the new regions, only Taoudénit (partitioned from Tombouctou Region) and Ménaka (formerly Ménaka Cercle in Gao Region) have begun to be implemented. Each of the regions bears the name of its capital. The regions are divided into 56 cercles. The cercles and the capital district are divided into 703 communes. The regions are numbered, originally west to east, with Roman numerals. The capital Bamako is administered separately and is in its own district. The ten regions and the Bamako District are listed below. The population figures are from the 1998 and 2009 censuses. ^ "LOI No 2012-017 DU 02 MARS 2012 PORTANT CREATION DE CIRCONSCRIPTIONS ADMINISTRATIVES EN REPUBLIQUE DU MALI" (PDF). Journal officiel de la République du Mali. 2 March 2012. p. 364. Retrieved 21 February 2017. ^ Loi N°99-035/ Du 10 Aout 1999 Portant Creation des Collectivites Territoriales de Cercles et de Regions (PDF) (in French), Ministère de l'Administration Territoriales et des Collectivités Locales, République du Mali, 1999, archived from the original (PDF) on 2012-03-09 . ^ Évaluation de la coopération décentralisée franco-malienne La coopération décentralisée franco-malienne, état des lieux, Ministère des Affaires étrangères et européennes (French Ministry of Foreign Affairs). ^ Resultats Provisoires RGPH 2009 (PDF) (in French), République de Mali: Institut National de la Statistique . This page was last edited on 30 March 2019, at 20:13 (UTC).